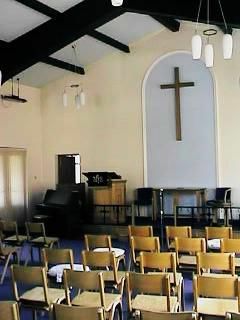 There are two Welsh churches in the Manchester area, both belonging to the Presbyterian Church of Wales, one in Altrincham and the other in West Didsbury. Joint services are held on Sundays, either at Altrincham (10.30 am) or West Didsbury (2.30 pm), at which visitors would be warmly welcome. To avoid disappointment, please check in advance which location is being used on any particular Sunday. The Rev. Eleri Edwards, our minister for the past few years, still continues to serve the Welsh community in a voluntary capacity. Visiting ministers from Wales also come to take services from time to time. "Thy word is a lamp to my feet and a light to my path." The annual singing festival takes place alternately at the chapels in Altrincham and West Didsbury when the congregations get to grips with a selection of hymns old and new. Much practising takes place over the winter months under our local conductors Trefor Davies and Eflyn Evans to learn the new hymn tunes and polish the old ones. In 2016 the Gymanfa was held at Altrincham under the direction of Mrs Ilid Anne Jones, Glasinfryn, with Mrs Lilian Garrett at the organ. The Gymanfa in 2017, again with Mrs Jones and Mrs Garrett, will be at Oaker Avenue on Sunday, 14th May, 2.30 pm and 5.00 pm. For details, please contact Mrs Eflyn Evans, tel. 0161 445 9366.